Tuesday was the first day of winter, but it felt more like spring in North Texas. "This is ridiculous," said Dallas resident Francisco Neira. "Last year, it was snowing and this year, it's all hot and 80 degrees." The high Tuesday was a toasty 85 degrees, shattering the old record of 82 degrees that was set back in 1981. "I live in Texas for a reason, and this is the reason right here," said Ashley Alsip. She wore a sundress and sandals as she crossed the last items off her holiday shopping list. While the shorts weather is sitting well with some adults, children aren't as fond of it, especially ones who are old enough to remember last Christmas. 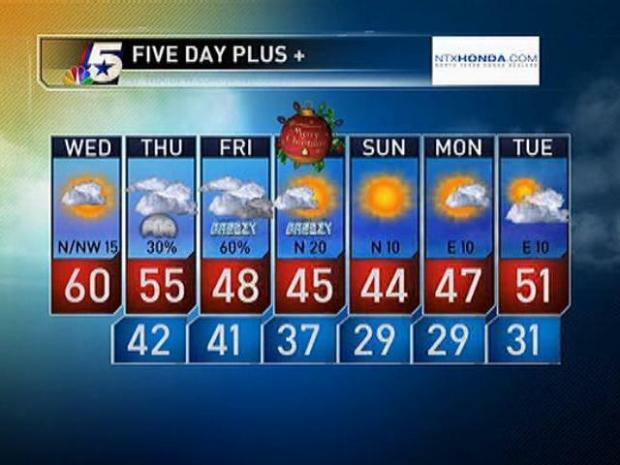 NBCDFW Meteorologist Jennifer Lopez updates the morning video forecast for Dec. 22, 2010. "They want snow like last year," said Dan O'Leary, a Flower Mound father of two. Last year, North Texas got its first white Christmas in 83 years. And at this rate, it could be another 83 years before it happens again. "One of the things I like about Texas in general is the instability of the weather," shopper Aishah Davis said. "You get these little breaks in the middle of winter, and it feels like summer. It's great." But the unseasonable warmth is already on its way out. Temperatures are expected to only climb into the mid-40s on Christmas Day.